Military speech topics and ideas for writing a speech on military and the army stuff like air missile defense strategies or ways to salute in different countries. This page is broader than only on the US army, air forc, and navy issues. I try to cover for you as much persuasive and informative themes as possible related to defense and armed forces, militias, the marine corps and coast guard. This is one of my special speech topic idea pages. Air missile defense strategies in East Europe. Small arms and light weapons sales in malls. Structure of our armed forces; at sea, on land, in the air. Famous battles and wars that form our nation. Chain of command in special operations. Bases, camps and forts as the defense line. Intelligence services: do they cooperate? Nuclear weapons stock by country or region. Bunker busters; how do they work. Patriot missile defense as an example of military engineering. Medal of Honor categories and heroes. Purple Heart conditions and recipients. West Point Academy education curriculum. Naval Coast Guard operations on the seas. Chief of Staff position and power. Megastructures engineered for the army. Army marching bands and orchestras and their history. Ways to salute in different countries. Pentagon building architeture of concentric pentagonal rings and radial corridors. Life in a submarine for ten months. African Union should increase the number of troops deployed in the Sudanese Darfur province. Military actions against regimes with hostile policies is inevitable. The effect of war on the economy. Closer diplomatic ties with North Korea will mean more control. Decommissioning is the only way to negotiate with war lords in Sudan. Diplomatic immunity issues in dictatorial systems are based on military power. Efforts to bring Nazi war crime suspects to trial will never be successful. Every citizen should commit to 2,000 hours of voluntary national service in their lifetime. Have more women in military staff functions. Immigration control is important to preserve security and culture. It’s not cowardly to refuse to fight in a war. Kids are most likely to become child soldiers if they are poor. Military service should be based on conduct, not sexual orientation. Mothers must be persuaded not to fight in militairy combat front lines. Negotiating with terrorists is justifiable. Restrictions on weapons trade ought to be more severe. Sometimes force and violence are needed to make peace. Support initiatives to help child soldiers. The military corps – professionals and / or voluntareers. The next great world war will be in western Europe again. The US-Mexican border fence to tighten homeland security does not work. The use of torture is never appropriate. There should be a Code of Conduct in the arms trade. Unilateral military action is wrong without the consent of the United Nations. We must never stop honouring war veterans. Women in front-combat lines: ban or not? Role of women in World War II; female power behind the screens. Famous female intelligence spies, there are more than you think. Sexual harassment policies in the military. Women on high positions in the army. Seagoing positions and responsibilities on combat ships. History of the position of women in military service. All jobs in the air force should be opened for females. Effects on morale, training, and unit workload. Are smart bombs really that smart? Nuclear proliferation treaties do they bring a peaceful balance? Arms trade codes of conduct by the large co-operating governments. Regional conflicts. Cover not all of course, but I think you could pick out one or two and compare the similarities and upper-regional consequences in the long term. Space security – a myth or already taken in position in secret agreements? Use of dirty bombs and the international protests against it. GI Bill on caring for veterans. Military budget cuts and spending balance. 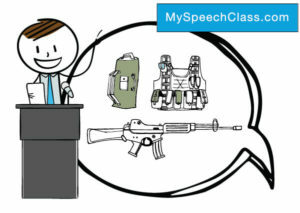 Cite this article as: Jim Peterson, "66 Military Speech Topics [Persuasive, Informative]," in My Speech Class, October 4, 2018, http://www.myspeechclass.com/military-speech-topics.html.